A quick post this evening to link up with Lily Patch Quilts and Christmas Through the Year. I won't fret over it. green blocks. So I took one of those blocks, added a couple of borders, and made a 10 x 10 mini. It will be handy to have on hand come the holidays... perhaps a stocking stuffer for my daughter, daughter-in-law, sister, or ??? Why not pour a cup of coffee and enjoy it while checking out the CTTY pretties at Lily Patch Quilts? I can't think of a better way to spend a few minutes of the day!!! I'm making progress on my red Moravian Star... I have 1/2 of the required stars done, but not quite all stitched together. My fingers were getting sore! Six, 5 diamond stars will make half of a Moravian Star. Queen Dee sent me a picture of her finished star yesterday... it's a beaut!!! One more star you must simply check out is a Christmas fabric Moravian Star by Sara. Click here to go to her blog. It's also a beaut! This beautiful creation belongs to LeAnn, a very talented quilter who joined Nor, Queen Dee, Sandra, and me for a Saturday of sewing! LeAnn was working on making her second star, Nor and Queen Dee had their diamond templates prepped, and Sandra and I were starting at the very beginning! LeAnn is making more fabric covered diamonds. Nor and Deb combined 5 finished stars for the picture at right. Twelve stars are needed to make one Moravian Star. Along with Sandra, they are sharing fabric scraps to make the stars. I am using red fabrics to make my star. Just to give you an idea of some of the necessary supplies needed... very thin fusible batting pressed onto a 12 x 12 piece of cardboard purchased at my local scrap booking store. The metal, 60 degree diamond template is 1" in size, available here. (You could make your own template, but I have this one, and it worked out beautifully!) The blade in the rotary cutter is an old one, because it cuts through the batting backed cardboard. I opted for an Elmer's glue stick... I found that fabric fusing glue was too runny, and took too long to dry. 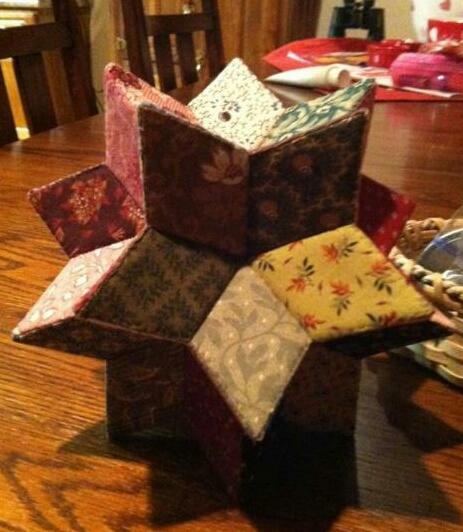 There is a tutorial on how to make a woolie Moravian star here, and from there you can click on her YouTube video demonstrating her method. (We didn't use this tutorial to make our stars... I found it when I was researching 3D Moravian stars). I am waiting to hear back from a very talented lady in blog land, to verify the instructions we used are indeed hers. We made some changes of our own, (don't we all??? ), but I still want to make sure I am giving credit to the right person, in regards to the instructions we collectively used. This will be a work in progress, but it is one that I am thoroughly enjoying! I have three stars made and nine to go. It's the perfect hand sewing project for the cold weather months here in the Midwest! Is there a better way to end the week then in one's sewing room? Mine was a welcomed refuge after a crazy week at work! I finished Lori's Sew Along Block, Abundance. It has been fun viewing all the Abundance blocks that have invaded blogland! Thank you Lori, for sharing your talent with so many of us... your instructions were awesome! I'm looking forward to more Sew Along tutorials from you! A little doll quilt for my favorite childhood doll! I'm pleased with the results, although I should know better than to sew when I'm tired! This block is far from my best work... I almost didn't post this picture! But, you know what? I've never made the perfect block, or the perfect quilt! I won't be entering this in the Iowa State Fair come this summer, and I don't allow THE QUILT POLICE in my sewing room! What makes me happy is how the finished block looks with my favorite childhood doll. Her flannel pajamas pick up the fabric colors of the block... and I didn't plan that! Today I spent a good part of the day with four other quilting gal pals, each of us making a Moravian Star. It was an enjoyable day, and I'm liking this project! This isn't something that can be made in one day... it will be a work in progress, and a fun one at that. I will post about it in a day or two. Most of the time I keep my seam ripper handy for the dreaded duty of cutting threads that I just machine sewed together. Several evenings this week I have been relying on my trusty Clover ripper to assist me in ripping threads that I stitched over a year ago. Can you read what it says? Just barely. It looks great under my Ott light, but in natural light the blue threads fade into the grayish linen. This doesn't make me happy, so I did this. That seam ripper worked overtime in my steady hands as I began to slice away at those cross-stitches. I still have a few more words to go, but I wanted to get an idea of how my new color choice would work. Using DMC #336, I skipped around the pattern and began cross-stitching words that would show up, even in the dullest of lighting! It's more true to the original design. (Just like I change fabric that comes in a quilt kit, I have a terrible habit of changing the color of floss a cross-stitch pattern may call for... a not-so-good decision in this case. When will I learn?) So when I'm done, this little cutie will read, "Needle and thread, Needle and thread, When starlight fades I lay them to bed." Nothing like making it twice the work, but in the end, I will like it better! Work has been crazy busy. I'm come home and I'm spent, more mentally then physically. We are changing to a new software program later this spring, and the preparations for it are occurring now. "Spare" time, (non existent in the medical field), is to be spent learning the new modules in tutorials that are long and baffling. I have been staying after hours to meet the February 8th deadline. Well, enough about that. My point is, it's cutting into my sewing time, and that's the real evil here! Lori's Abundance block is all over blogland, and it's been fun seeing all of them. (Rogue Quilter's is my favorite so far... see it here). Time for a personal plan of action for Friday Night Sew In... spend an abundant amount of time cutting and piecing a little Abundance block of my own! My fabrics have been selected (and changed out a few times...) since last Saturday. Looking forward to Friday night! What will you be sewing? Lori at Humble Quilts will share directions to make a reproduction vintage doll quilt on Monday, January 21st. Lori posted a picture of the replica on January 18th, with detailed descriptions of the original fabrics used. She also posted a couple of pictures of her 12" finished quilt. Lori has named the doll quilt "Abundance," as a reminder to be thankful for the abundance in our lives. (I like it!) This morning I selected the fabrics I plan to use to make this cutie. My selection may change between now and Monday... best to wait for the directions to get a better idea. I think the blue fabric I picked out may be a bit dark, so I'll scour through the blue stash one more time. It looks really dark in the photo! Looking forward to the directions! Thank you Lori! A few days ago I posted a picture of a mini quilt I made. It's from this book. Here is a picture of Tabitha's Trickets, from Simply Charming, originally posted on Monday, January 14th. Darlene at quiltingdaze.blogspot.com left this sweet comment for me. "Love your mini quilt - it's adorable. I, too, own that book and love every project. You need to make every quilt in the book. :)"
Darlene had a great idea! We would like to invite all of you to join us in making a quilt from this book every other month, at least through 2013, and then who knows? You can select the pattern you want... no stipulations from us. No competition, no challenges, just make 'em for fun! (Every other month was my idea, mostly because I have this thing called a full time job... and a few other responsibilities that occupy my time. I'm sure it's the same for many of you). Here are pictures of a couple of the quilts in the book... very tempting! No sign up necessary... just leave a comment on Darlene's blog or on mine. Begin in February, and we will remind you every other month from then on. If you have to skip a month, that's okay... no pressure, remember? Have fun, and good luck on deciding which quilt to make first! (If you have already made one of these mini's, you're ahead of the game!) So, come join us! It must be MINI month! Maybe I like making mini quilts because I can see results more quickly. Yep... I'm pretty sure that's the number one reason! And they are just plain fun to make! Earlier this month I decided to join Kathleen Tracy's Second Annual Challenge to make one small quilt a month in 2013. (Read more about it here. Go to Kathleen's January 1, 2013 post.) Kathleen has published several wonderful small quilt books. The idea is to make a quilt from one of the books each month this year. Kathleen also has free, small quilt patterns on her website. The kick off quilt for January is a small quilt of your choice from one of her books or patterns. I choose the Scrappy Triangles Doll Quilt, as shown in the picture above. It is a free pattern on Kathleen's website, available here. Kathleen will have more free patterns for small quilts in 2013. You must visit her blog and see for yourself! At the AQS quilt show in Des Moines last October, I purchased a 2.5 inch, 100ct. light and dark charm pack from the Primitive Gatherings booth. I used some of the charms from the pack to make the doll quilt triangles, and raided my scraps for the two border fabrics. It's a flimsy in this stage. I hope to finish it this weekend, and add it to my short list of 2013 completed projects. It is by no means perfect, but I'm working on lining up those seams! It's scrappy, and that helps to hide my imperfections. Do you enjoy making mini quilts? How do you display them? One of my most favorite Christmas presents is Simply Charming, Small Scrap Quilts of Yesteryear by Tara Lynn Darr. The books has 20 classic patterns ranging in size from 15 x 18 to 23 x 26, and one is better than the next! You can use a 5" charm squares or smaller for every pattern, but will need additional fabric for the borders, backing, and binding. It wasn't an easy decision, but I decided on Tabitha's Trinkets for my first project from the book. The pattern calls for a total of 80 assorted 2 3/8 x 2 3/8 inch squares, 40 in assorted dark prints, and 40 in assorted light prints. I had a mini charm pack (2.5 inch squares), of Metropolitan Fair, by Barbara Brackman for Moda. I used 40 2.5 inch squares from the pack, but did not trim the squares, and cut 40, 2.5 inch squares from my stash of shirting fabrics. Simply Charming is published by Kansas City Star Books. I omitted the two borders called for in the original design, and opted to back and bind it as shown below. My finished size is 13 x 15. With the borders, the original pattern would finish to 18 x 21. I love mini's and I'm very happy with the results! Once again I left the machine quilting to simple cross hatches. I love every single pattern in this book, so it's going to be hard to decide which one to do next! Backing up to before the end of 2012, I want to share a picture of a mini Christmas tree skirt my sister made for me. A treasure from my sister! The fabrics are from Sentiments by 3 Sisters for Moda. She told me she found the pattern in a stash of "oldies" that she has kept for many, many years. I love the scalloped edges, and the simple quilting that accentuates it. I purchased a few fats of this fabric line last fall, and now with this darling tree skirt, I will be inspired to make something fantastic to compliment it! I joined "Christmas Throughout the Year" for 2013... (see www.lilypatchquilts.com, post dated January 1, 2013, for details). So I already have a future Christmas 2013 project waiting for me! Happy sewing days! Keep those sewing machines humming! I feel like I've been gone from "real" blogging for ages! It was easy hooking up the new computer... but I'm having difficulty getting use to Windows 8. Seriously, why do they assume that everyone is a self made techie??? Anyway, it's good to be back! Oh what fun it is to have quilting gal pals make blocks for you! Our Threads group project for 2012 was paper piecing. I chose an off centered log cabin for my block. I gave the pattern and fabric to the other girls participating and they each made a block for me. I made this small table runner using blue and off white fabrics because I specifically want it for display in January. (Here it is with one of my favorite poems in book form, Stopping by the Woods on a Snowy Evening, by Robert Frost). I kept the machine quilting very simple with straight lines. I had one extra block that I made into a hot pad. The finished size is 13 x 26. We have snowballs! Darlene's instructions were excellent, and pictures were included. I'm using civil war fabrics... looking forward to Friday, February 1st for step 2!!! Other weekend duties are calling and I must answer them. Admittedly, these duties are not as much fun as talking to all of you. But hopefully, I will be able to spend some time today with my Janome, because, after all, that duty is calling as well! Happy days are here again...almost! Well my goodness! I didn't expect that my little world of quilting would start out this way in the new year, but life is full of surprises! As suspected, the hard drive in my computer crashed in late December, so out with the old and in with the new! I'm hoping to set all the necessary components up this weekend, teach myself all about Windows 8, and dive back into blogging! I've missed visiting all of you by way of new posts! The good news? My sewing machine has been humming away! With a little extra time on my hands it has been fun reading favorite blogs and admiring the projects that have been started, finished, or contemplated. I have also enjoyed looking at the "2012 completed protects" posts that many blogs featured. Some great over achievers out there, with wonderful eye candy to share with quilters and fabric hoarders everywhere! I can't think of a better way to spend spare moments. I hope to have a new post with pictures to share with you very soon. In the meantime, keep sewing!